Thanks to electric motors getting both more powerful and more portable almost simultaneously in the past few years, one thing that is absolutely taking over the market is electric rideable tech. Electric skateboards are the latest and greatest in personal transportation, and they are fun for both seasoned skaters and newbie tech lovers alike. We rounded up 10 of the best electric skateboards on the market right now to help you decide where to start. Stick around for the end of this article, where we’ll show you how to shop for electric skate boards so you’ll always have the best ride for you, as well as provide some tips for checking out the warranty on electric skateboards and more. Before we jump into the individual reviews, here’s a quick glance at the major features of each board that made the cut. Boosted Mini x Electric Skateboard 20mph 220 lbs 4.5 $$$$ Check on Amazon! RazorX Cruiser Electric Skateboard 10mph 220 lbs 4.5 $$$ Check on Amazon! 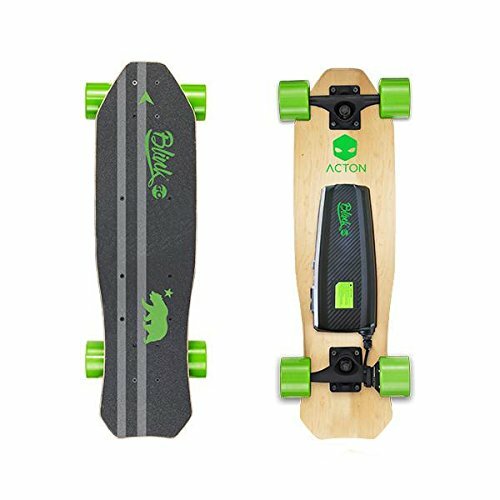 ACTON Blink Lite Go 10mph 130 lbs 3.5 $$$ Check on Amazon! 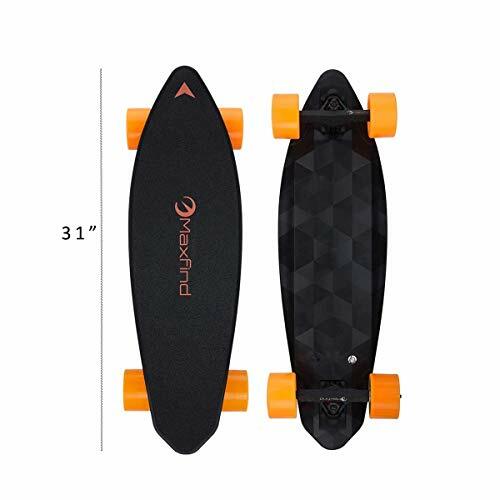 Maxfind Penny Board 23mph 265 lbs 4.5 $$$ Check on Amazon! Maxfind MAX C 13mph 176 lbs 4 $$$ Check on Amazon! Epikgo Electric Longboard 25mph 250 lbs 4.5 $$$ Check on Amazon! E-Skateboard Penny Board 15.5mph 178 lbs 4 $$$ Check on Amazon! 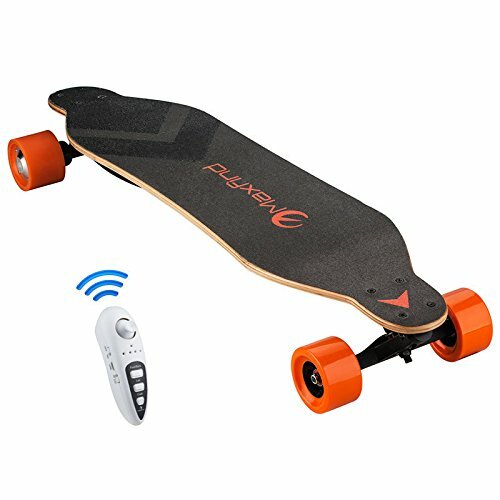 Maxfind Electric Longboard 17mph 176 lbs 3.5 $$$ Check on Amazon! Evolve Skateboards 26mph 200 lbs 4 $$$ Check on Amazon! 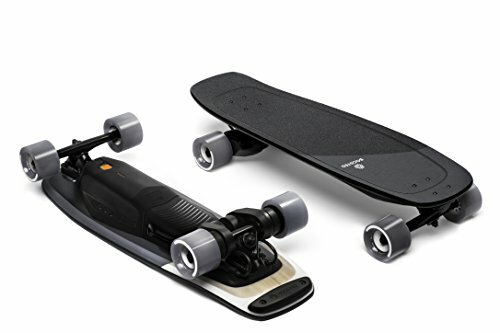 Inboard M1 Skateboard 24mph 280 lbs 4 $$$$ Check on Amazon! When it comes to pure rideability and power, we kick off our round up with the best on this review list. Boosted Mini x Electric Skateboard offers a supremely comfortable ride, with plenty of speed and great brakes. It also boasts one of the higher weight limits that we’ve seen on electric skateboards, making it more accessible to all kinds of riders. Another big plus is that this high powered skateboard is in compliance with TSA rules regarding lithium batteries, so you can carry this skateboard with you on most planes – great for skaters who travel for work and want to let off some steam in new cities. It is rated for a 25% grade, and does all this with very little extra weight – the board itself weighs only 15 pounds. One cool feature that the Boosted Mini x Electric Skateboard offers that other boards don’t is the ability to switch between a standard battery use (which gives you six miles of range), or an extended battery mode (which doubles your range). 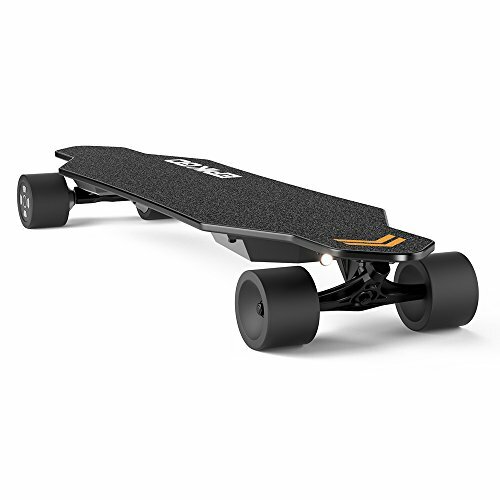 These are also made with vehicle-grade materials for ultimate durability, and the board has a sleek, low-profile design that would make it great for commuting to work. Yes, the price is steep, but the quality and features make this motorized skateboard ideal for the serious rider. The Razor-X Cruiser is the least expensive option on our list, and as such, it’s not going to hold up to some of the higher range boards. That being said, we were shocked at how powerful this cheap little board really is. It’s got a hefty weight limit to make it more accessible to larger riders; it can get up to 10 miles per hour – which is fantastic for the price – and it seems to handle hills with relative ease. The deck is maple, which may not be as sturdy as some other choices, but it does mean that you’ve got a nice lightweight board that will move easily. One thing that makes this board so inexpensive is that it’s a kickstart – meaning there is no chain or belt involved. That means you have fewer parts to maintain or replace in the future, which could be a plus for skaters who aren’t mechanically inclined. The board itself weighs just over 10 pounds, so you could use it as a regular cruiser board in a pinch. While it doesn’t offer any of the extra bells and whistles that many other boards have, this one would be the perfect introduction to electric skateboarding for kids. Acton is a brand that got its start on Kickstarter, and it’s been a fan favorite since then. It’s definitely one of the more stylish boards we reviewed, with the signature bear silhouette on the deck, the light wood underdeck, and the lime green wheels. For the price range, the Acton Blink Lite Go is surprisingly versatile. It’s super lightweight and it has a whopping 5-mile range – much farther than some more expensive models. However, the Acton Blink Lite Go won’t hit the top speeds of other midrange electric skateboards, and it doesn’t have a swappable battery – meaning you can’t extend the range by carrying an extra on you. On the plus side, though, the board was made for carving and gives you a lot more maneuverability than other options. Add on the fact that it offers a heavier weight limit than many of its comparable alternatives, and the Acton is definitely a contender for an adult rider that spends time on curvy routes. It’s one of the few electric skateboards out there so we think it’s more than earned its spot on this list. Coming in at just eight pounds, this kit is definitely one of the lightest electric skateboards we’ve reviewed. It’s popular as a commuter’s board, but don’t expect much in the way of power or extended range. You’ll get a solid 16 miles on one charge, but it’s light enough to use as a regular skateboard if you run out of charge before you get where you’re going. Additionally, the Penny Board is certified for taking on airlines, so you can pack it for your trip. One thing that makes the Penny Board an excellent choice for the price range is that it offers swappable batteries – carry a replacement with you, and you can extend the range to double the usual amount. That’s not easy to find at this lower price range in electric skateboards, which is a big reason why this one made the list. If you commute around a very hilly area, you won’t find a ton of use for this board. The Maxfind motor just isn’t powerful enough to handle an incline that could be described as more than slight. Additionally, the weight limit on this one is much smaller than alternatives like the Acton Blink series. 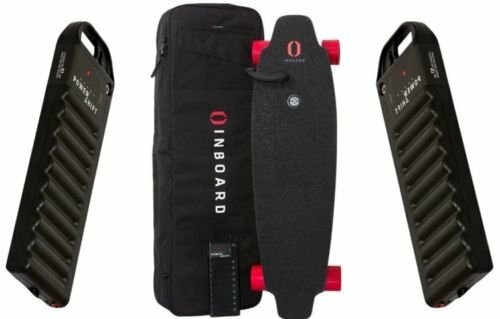 But for the price, it makes an excellent starter board for kids or teens, or for adults who don’t want to commit to a large budget before getting a feel for electric skateboards. If the Maxfind Penny Board is made to be a commuter’s best friend, the Max-C takes portability to an almost unnecessary level. This is the lightest board on our list, at just under eight pounds, and measures just 27 inches long. However, it still holds an adult and can be professional enough to get around to work or classes. The big bonus behind the Max-C is its waterproof rating. This is one of the only electric skateboards we reviewed that can handle wet road surfaces and even skates through puddles without worrying about the electric components. This lightweight board also comes with a remote control. 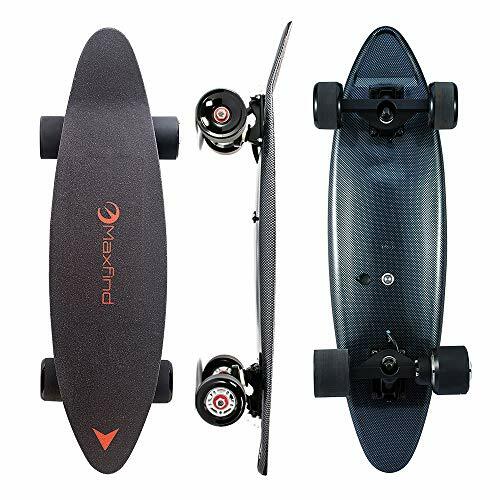 Like the Maxfind Penny Board, you get about 10 miles per charge with this board, but unlike its older brother, this one can handle hills much better. You can go uphill about 15 degrees without losing any power, so it’s much better as an everyday commute board for those who live in slightly hilly areas. With such a lightweight, there is no problem with using this as a regular skateboard when the battery dies. 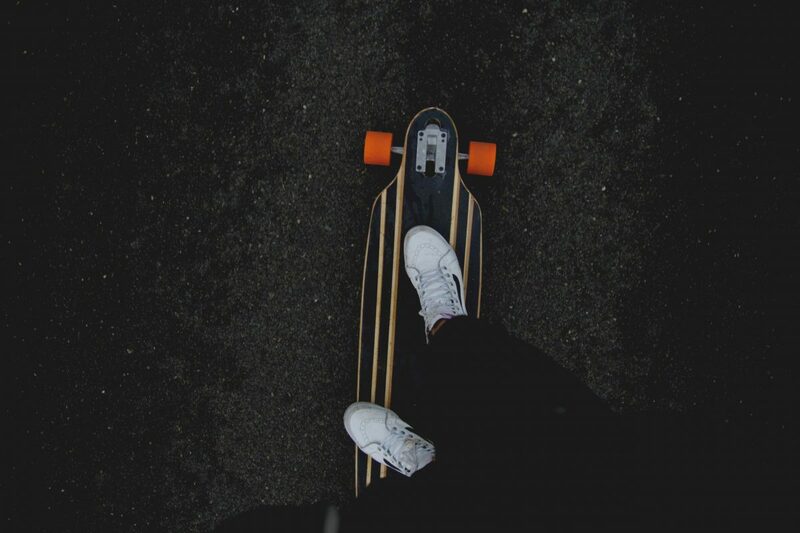 The only downside we saw is that this board takes about twice the time as the Maxfind Penny Board to charge back up – up to an hour, where the Penny Board takes just 30 minutes. When it comes to aesthetics, the Epikgo Electric Longboard is the clear winner on our list. The all-black design with its sleek profile and almost ninja-like looks makes it a very cool addition to an electric skateboarder’s collection. This one could be considered on the lower end of the high-end skateboards, with a price tag that comes close to four digits. But for all that money, you do get a few pretty cool features. This one is water resistant, though not quite waterproof, and is lighter than other longboards we reviewed, coming in at only 11 pounds. It’s also slightly shorter than other longboards on our list, measuring 35.5 inches long, so it’s slightly more portable. There are two main reasons that the Epikgo is worth the cash in our opinion. First is the speed; this board will hit up to 25 miles per hour at top speeds. The second is the maneuverability. This board was specifically designed for carving and has extremely responsive brakes so that you can move in whatever way you need to during your commute. You can also get a slightly longer range on this one, about 10 miles, although you can’t change out the battery to extend that range any. The E-Skateboard Penny Board may not win any awards in any categories, but it is one of the most affordable skateboards we’ve reviewed, and it can hold its own among several other midrange options. For that reason, we’re dubbing this one the best option for kids or beginners who aren’t sure that they’re really going to love the electric skateboard. The quick stats on this one are: lightweight at under 10 pounds, small range of seven miles per charge, longer charge time at about an hour, and lighter weight limit of just 178 pounds. That being said, this motor is powerful enough to handle small hills, and the board does qualify to travel on planes. So with nothing but the affordability to really recommend this board, why did we include it on a list of best electric skateboards on the market? Well, for one, the reviews on this one are pretty much unanimously good. People who’ve gotten this for their kids ended up trying it and liking it themselves – and that prompted us to give it a go. It’s also extremely portable at just 27 inches long, so it’s easy to bring along with you anywhere you go. If you’re looking for an affordable way to get into electric skateboards, this is the way to go. 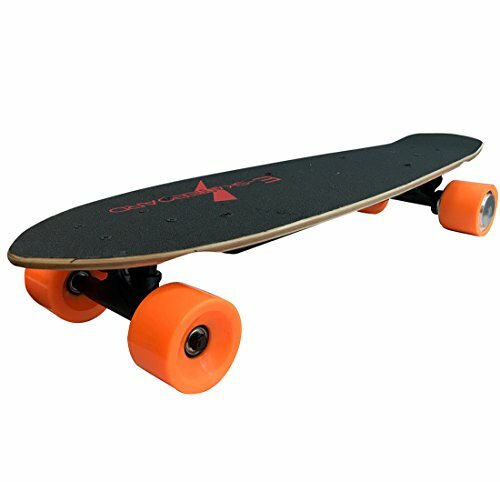 With several other solid contenders on this list, the Maxfind Electric Longboard offers a slightly different skating experience with the same midrange price and features. Made of Canadian maple for extra durability, this board will get about seven miles of range at about 17 miles per hour. It does have a light on the front for navigation, something that is lacking in a lot of other midrange boards, and the trucks are made of aluminum alloy – a much stronger material than the trucks made by several competitors. The motorized longboard style is often more comfortable for old school skateboarders or people with wider stances, but you don’t lose portability with this board. It still only weighs about 12 pounds, and the deck is only 38 inches long. You can still easily strap it to a backpack without it getting bulky. Unlike a few other Maxfind boards, this one has the guts to make it up hills, and the Canadian maple gives you more stability when you pick up speed going downhill. All in all, this one falls at the upper end of the midrange price range, but it’s a great choice for a rider that wants a more traditional skateboard feel. If you’re trying to balance budget woes with getting a quality electric skateboard, the Evolve Skateboard is the best midrange option we reviewed. It’s not going to give you the same kind of power as a high-end board, but it blew away other boards in the same price range in terms of the weight limit, speed, and durability. It’s also got one of the longest ranges of any of the boards we reviewed, letting you go up to 18 miles on one charge. The design is a little less sleek than other models, but that kicktail shape gives you better balance and control over the board, so the pay off may be worth it to you. This is not the lightest board we reviewed, coming in at about 23 pounds, but the durable materials and sturdy construction make it great for beginners who aren’t as comfortable on a board. One thing we noticed was that this board didn’t have the best brakes when going downhill, so consider a different model if you live in a very hilly area. Overall though, if you want to get as much of the high-end quality as you can for a mid-range price, this is your board. The Inboard M1 has nearly an equal mixture of pros and cons, and for the price range, there are certainly better options out there – but it did still make the cut as one of the best electric skateboards on the market for a few reasons. First, it’s one of the fastest boards we found, hitting about 24 miles per hour at top speeds. That’s much faster than most midrange electric skateboards, and it’s got a heftier weight limit as well, so it’s accessible to more riders. The braking on this one is much more responsive than even our top-rated skateboard, and according to the Inboard website, you can take this one on airplanes with you. However, this board has a serious issue with range. It only gets about seven miles on a single charge, and it doesn’t have the guts to make it up steep hills. Just 18 degree climbs will stress the motor. On the other hand, though, it is one of the lighter boards we reviewed at 14.5 pounds, and it comes with a swappable battery so you can carry an extra charge on you to extend the range if you want. Now that we’ve looked at the market’s top electric skateboards, let’s talk about how we reviewed these, and what features you should be looking for when you shop. For our purposes, there are 12 main features or characteristics about electric skateboards that should be evaluated. How does it feel when you ride on it? Nothing matters about a skateboard of any kind if it doesn’t feel good when you ride it. You want the ride to be smooth, stable, and to be able to maneuver easily – but your skill level, posture, and riding style all affect how a board feels and reacts to you. So this is a highly personal thing that only you can rate for yourself. Try out many boards to get an idea of what sort of ride feel you are looking for. Is the price right? As we said earlier, the prices on electric skateboards are almost always in the hundreds. However, a $200 board may be a lot easier on your budget than an $800 board. Unfortunately, it’s hard to report the price on many of these boards accurately, because choosing any extras can make the price change drastically. We chose boards from all over the budget range, and many of these are very affordable for electric boards. Does the board have a long range? Most people use electric skateboards to solve the “last mile” problem of public transportation. When you get off the bus or train and need to go that last mile to get to where you are headed, this board is perfect. However, if you want a board that will cruise around a little longer, you’ll need to look for one with a longer range. Some electric skateboards can go as far as 30 miles on a single charge, while some only go up to five. The thing that governs this feature is the size of the battery, so you always pay a price. The longer the range, the bigger the battery – which means the board will be heavier and harder to maneuver. What type of motor does the board use? There are two types of motors that electric skateboards use. A slower in-wheel hub motor, which has the advantage of being more affordable, and a belt drive. The belt drive is the better of the two, offering speed and maneuverability, but it also makes the price a lot higher. Belt ripping is also a common problem. Do you like the board shape? You can get electric skateboards in many shapes. 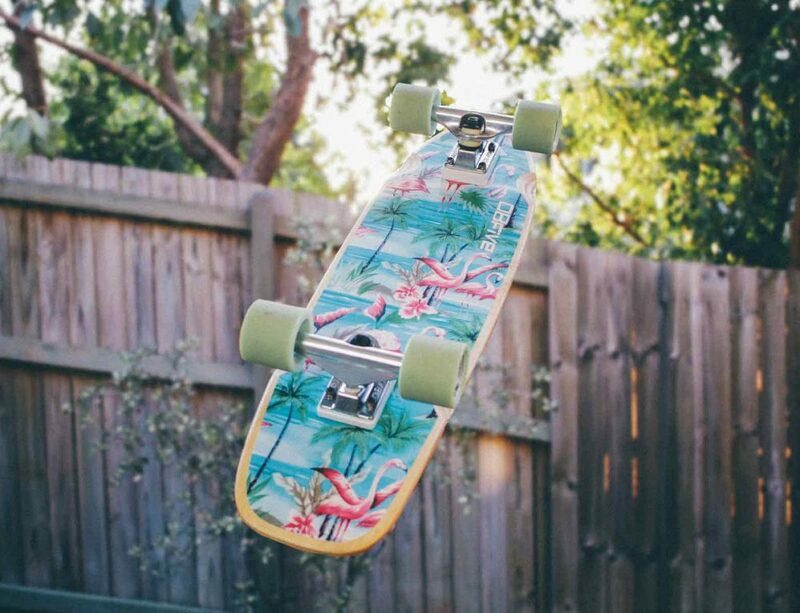 Do you prefer a pintail or a mini-cruiser? What about a drop-through? The shape you prefer depends on the type of skating you want to do. For example, pintails are fast and stable, but not quite as maneuverable as a mini-cruiser. If you are commuting in an urban area, being able to get around people and obstacles will be more important than if you want to ride around in open areas. The board material will have a big impact on how lightweight and how durable your board is, so pay attention this as well. The most affordable option is maple, but it lacks durability. One of the best options is carbon fiber – wonderfully stable and great for cruising on smooth pavement – but it can be expensive. Look for the best quality material you can find for your budget, and you’ll have the most durable skateboard. The next thing we looked at is speed. Speed isn’t often the top concern – as long as the board requires less energy and gets you faster than walking speed, most riders are looking for other features. Most of the boards we reviewed don’t get up to 20 miles per hour, which is normal for mid-range electric skateboard. However, the more expensive models like the M1, as well as the surprisingly speedy Epikgo Electric Longboard offer speeds up to 25 miles per hour. It can be dangerous to go that fast in crowded areas. Beginners are probably best served by a board that tops out between 12 and 15 miles per hour. The remote for the motor is the next feature to consider. A lot of these brands use the same remote for every electric skate board they make, which is useful if you ever want to upgrade within the same brand. Generally speaking, the best remotes are the ones that are simple and easy to use when riding. If you have to look at a screen to use it, it’s not the safest thing. Now it’s time to think about how long it takes the board to charge between rides. Will it charge during your eight-hour work shift for your evening commute? Can it charge during a three-hour study session at the library? Does it require a full overnight charge? This will definitely impact how useful the board is for you. We also noted how much rider weight the board can carry. Simply put, getting a board that won’t support you will mean you can’t go as fast, as far, or for as long. The board will wear down faster if it operates at all. Choose something that suits your weight. 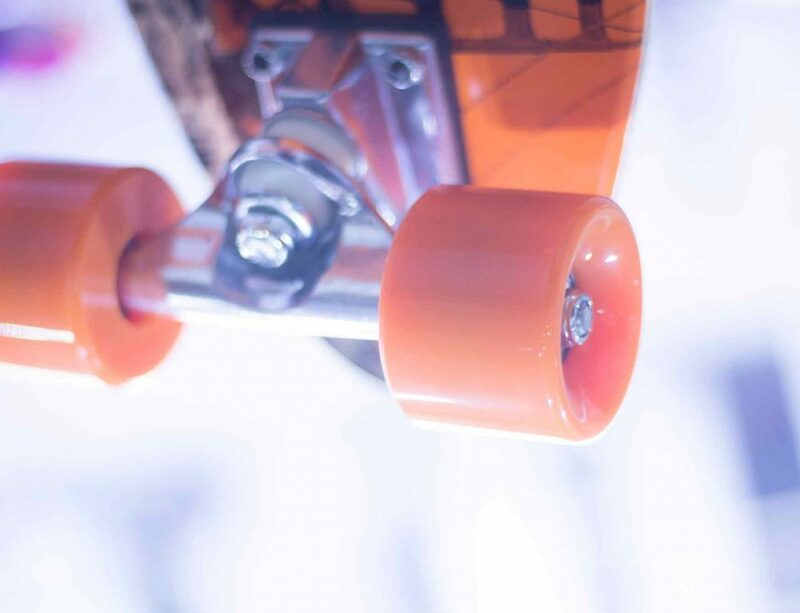 Check out any extra features that the board includes, like safety lights on the rear and front, or light-up wheels. This can be the factor that helps you choose between two comparable boards. Another “extra” feature may be the ability to carry the board in a backpack or store it in a locker. Look for a small, portable board if this is what you want to do. The wheels are our final feature but are every bit as important as anything on this list. You need wheels that are durable, for a smooth and stable ride, but you also need wheels that are the right size for the terrain you will be mostly riding on. Bigger wheels are for uneven terrain and can slow you down on smooth pavement – but smaller wheels often can’t handle cracked sidewalks or gravel. Some boards also offer smart phone apps that can allow you to track your distance, share your rides with friends, and other things. This is just a nice “for fun” feature, but it doesn’t hurt if it’s included. Another “nice” thing to look at is how noisy the board is. Again, this feature may not matter to most riders, but it’s something you can use to help decide between two boards. Here’s something that many riders don’t think about, but can be important: Is the board, and all of the components of the board, waterproof? If your skateboard goes through a puddle or gets rained on, will the motor be damaged? You already know that bearings aren’t fond of getting wet, but that’s not quite as dire as wet electrical components. So now that you know these features or capabilities, you can take a check list with you when you shop for an electric skate board. While we were reviewing these top electric boards, it became very clear that safety should be taken seriously on these boards. Because you can get speeds of up to 25 miles per hour, you are definitely going to need a helmet. 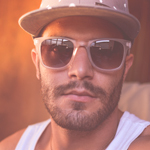 Even experienced skate boarders may want to wear a helmet because of the fact that you aren’t controlling your speed. If you ever need to bail off a moving electric board, you will absolutely need a helmet. Going more than 13 miles per hour on a board and trying to step or run off will result in injury. Additionally, keep in mind that riders under 18 may be required to wear a helmet on any sort of motorized device. Elbow and knee pads may be a good idea until you get the hang of riding. It’s a good idea to practice falling in a safe way, because it’s bound to happen at least once. Be sure that you are well aware of how to safely brake on an electric skate board. The motor’s remote has a brake option that you can use in most scenarios. However, if the board loses power, or if the motor malfunctions, you’ll need to manually brake. Braking and accelerating on an electric skateboard can be a bit touchy, so it’s a good idea to practice a lot before you ride around traffic or pedestrians. Electric skateboards are still new enough that other travelers on the sidewalks and roads don’t really know what the “rules” are with them. Bicycles may find you too fast to pass but too slow to follow. Cars may not realize how fast you really are going and turn in front of you. People may not even be aware that they need to move. Be sure you know where you are meant to be riding according to city laws and err on the side of caution when around any other traffic. Because this is a moving device with electrical parts, this type of skateboard is going to stand a greater chance of breaking than a standard skateboard – and that’s really saying something, because skateboards have tough lives. Wear and tear is common on all types of boards, no matter how durable or well-made they are. And because electric skateboards include complex components like belts and batteries and remotes, they’ve got even more parts that can break. That means that you’ll want to make sure you get a good warranty on your board. Look for a warranty that covers your board for at least a year if not longer. Be sure to check out which parts are covered by the warranty (just the electrical components? Everything but the electrical components?). Find out if working on the board yourself, or if replacing any of the stock parts voids your warranty. Find out how the warranty works, too. Do you have to send in your board for repairs if it breaks, or will they just send you replacement parts? Be sure you find out if there are any exclusions, like water damage. One good way to find out if a company’s warranty is legitimate is to take to the forums. Do a search for the name of the board, or just the name of the brand, plus terms like warranty or repairs. See if you can find anyone talking about the warranty being helpful, not helping them at all, or anything else. Finally, remember that warranties are usually there to cover manufacturing defaults, not standard wear and tear. But this is still really important. With something that includes electric components, manufacturing defaults are more likely. So, you’ve chosen the best skateboard for you, and have been riding it around for a while. Maybe you’ve fallen in love with this “last mile solution”, and maybe you still need some convincing. But either way, your board is likely to break down at some point. There’s just no getting around the fact that these boards need some maintenance from time to time. How can you figure out what is wrong, and how can you make sure that your board stays in the best shape it can? The battery is one of the most common parts that needs maintenance. To keep the battery operating efficiently for as long as possible, you may want to experiment with speeds to see what speed gives you the longest battery life. This is the “sweet spot” and is usually about half the board’s maximum speed. Also, try to minimize braking, because this puts a strain on the battery to speed back up. Keep the board clean and the bearings clean as well – if the wheels are rolling smoothly, the battery has less work to do. If the board just isn’t moving at all, there are a few things that could be wrong. The battery could be dead (most likely). The battery may need replacing all together (also likely if your board is over six months old). The remote and the motor may have disconnected. Usually the remote will have a flashing indicator if this is the case. You’ll have to repair the two to control the motor again. Are you covering the top of the remote with your hand while you ride? This could cause the remote to not be able to communicate with the motor. Check the remote batteries as well. If any of these things isn’t the problem, you should contact the manufacturer of the board, or check out any owner’s manual that many have come with the board. A rarer problem could be that the motor wires disconnected. If your motor does not spin, or does spin but has a rattle, check that this isn’t the issue. Because this technology is still evolving, the current market for electric skateboards is all about getting what you pay for. If you are an experienced skater, and you know that you want something that will offer you specific functions – such as a long range, high speed, or excellent maneuverability – then be prepared to spend some money. Even in the midrange prices, you’ll be compromising on one feature or another for the most part. At the upper end of the midrange options, you can find boards that start to include great ratings in all these areas, but it’ll be hard to keep your budget low and still get it all with this technology. If you are a new rider, or you’re purchasing for a child, then you can find an excellent, inexpensive board that will offer a decent amount of speed, range, and maneuverability for what you need. Even seasoned skaters may find that this is the best way to get an introduction to the world of electric boards – just be ready to want to move up to something with more power pretty quickly. When you’re ready to find the best electric skateboard for your needs, let this guide help you narrow down your options for the best choice.